Mason Jar adapter, converts fruit jar into a chimney - fitting lamp. 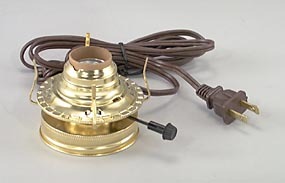 Brass plated burner and collar, electrified with U.L. listed parts including a 6 ft. cord set. Accepts a 3" base chimney. No reviews yet for the Mason "Fruit Jar" Adaptor.